In this article we’re discussing man portable off-grid power for amateur radio. Although I’ve already published the first three parts of this series (listed below), this introduction is actually the prequel to those three articles. Let’s take a moment to reflect on the articles previously published in the series. I’ll briefly try to explain what Man Portable off-grid power for amateur radio (from the channels perspective) means for me. Keep in mind I approach the Amateur Radio service not as a hobby, but a utility, aiding me in the off-grid adventures I find myself in from time to time. The following examples are the most common scenarios, where portable off-grid power is essential to my Amateur Radio goals. Sometimes I want to get outside and enjoy radio for the sake of radio. The comms are not critical, but I do want to augment the internal battery power, with a lightweight solar panel and external battery pack, for 4-8 hours at a time. In this example I’m looking at an extended field deployment. It can be a off-grid hiking trip like my hike to the Arctic Circle. Perhaps a training simulation, far away from the connected world. Or perhaps as a refugee after a natural disaster. In each case the off-grid power is essential to the trip, mission or endeavor. In this example I see myself operating from a fixed location over days, weeks, … with no expectation of grid power. I’ll be operating from a fixed location, in an extremely remote area. In this scenario, my goal is sustained off-grid power for scheduled comms, each day, throughout the duration of the deployment. There are many similarities between the three examples I mentioned above. Since it simply isn’t practical to build multiple systems on a ham radio budget, the goal is to put together a modular system which could be used in part, or in whole to fulfill each of the examples mentioned above. Moreover a modular approach allows me to expand capabilities when necessary, without reengineering the entire system. Moving on. When choosing the right panels, we do so with the understanding that the ability to accurately predict clear skies or cloud cover with great detail, is not an exact science. So we look at averages, over great periods of time, to predict the “most likely” wx scenario. We also ask how many hours of daylight will we have, how much of that is usable, and how many amp hours can we collect in that useable time. Finally, measuring how many amp hours my equipment consumes, worst case, every hour. That’s how we choose our solar panels. To offset the risk weather plays on our energy collection, we need to look at a storage solution. If you’ve been with the channel a while, you already know that I’ve tried nickel metal hydride, lead-acid in the off-grid ham shack, and most recently lithium ion with the QRP battery pack. Since this is less of an experiment, and more of a solution, I’m moving the storage solution forward further than I have previously. Storage is a bespoke, protected, lithium iron phosphate, or LiFePO4 pack. The cells and their connection method, lend themselves to an easy to build, yet modular pack design. This makes it easy for the tech to add capacity by simply adding more cells in parallel, either at the build phase, or later on in the field. For now, I’m focused on a 10Ah 4S1P LiFePO4 battery pack, although I may build a second 5 amp hour lithium iron phosphate battery pack for casual Communications. As with our original qrp battery pack, this pack also features simultaneous charge and discharge capabilities. This is achieved by integrating a battery management system with over-charge, under-voltage, short circuit, and balancing capabilities. Caring for the integrated battery pack, is an RF friendly MPPT solar charge controller to manage the 14.2 CC/CV requirements I have for the lithium iron phosphate cells. We’ve talked about collection, we’ve talked about storage, now let’s talk about distribution. Getting power out of the battery pack is generally a simple affair. This is especially true if we only have a single device to power. Unfortunately digital operators have a few extra pieces of gear over their voice or CW mode counterparts. As a digital operator, I carry the radio, a tablet or a laptop computer, powered audio interface, and perhaps some small LED lighting. When collecting Communications gear and computer equipment, I took care to ensure I would only have 12 volt or USB powered devices. Thanks to the solar charge controller, which has ports for solar panel, battery, and load, we simply have one powerpole port coming out of the charge controller, to a powerpole distribution box. The box features seven fused powerpole ports, one USB port, a pass-through port, and voltage display. Since a large percentage of ham radio operators working portable, do so casually for not more than a few hours at a time, their focus is on having battery power which lasts about the same amount of time. In contrast there are those operators like myself, who want to stay out in the field operating completely off grid, with some sort of renewable energy source. In the old days solution could have been a diesel generator. These days, even with the risk of poor weather, solar panels have become ultra lightweight, and less expensive than in previous years. 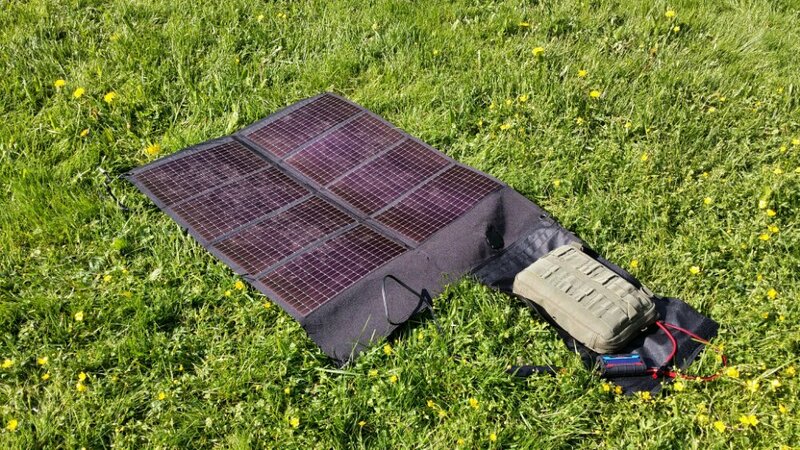 For most of us, solar power is the only viable off-grid power solution when portability is a critical requirement. Unfortunately when choosing solar power as a renewable power source, we do so with the understanding that the way we operate must also change. For myself that means operating qrp digital, employing efficient modes and balancing output power between qrp to 20 watts, with 20 watts being the maximum power output level for my field station and critical comms.